TCP J04432130+4721280 = V392 Per nova eruption (6.2 mag)? Yuji Nakamura, Kameyama, Mie, Japan, reports his discovery of this TCP (mag 6.2) in Per on a CCD frame taken on 2018 Apr 29.4740 UT (limiting mag 12.5) using a 135mm f4.0 lens. The object was not shown on a frame taken on 2018 Apr 21.4627 UT (limiting mag 12.5). There is a UG type variable star V392 Per at this position." Confirmation, spectroscopy, multiband photometry, and precise astrometry are very urgently required. The ASAS-SN Sky Patrol (Shappee et al. 2014ApJ...788...48S and Kochanek et al. 2017PASP..129j4502K) recorded a dwarf nova outburst with a very slow (GK Per-like) rise in 2016 February/March (that outburst was visually detected by Carey Chiselbrook at mv= 14.2 on 2016 Feb. 28.04722 UT). The very slow rise to outburst maximum indicates a long orbital period. 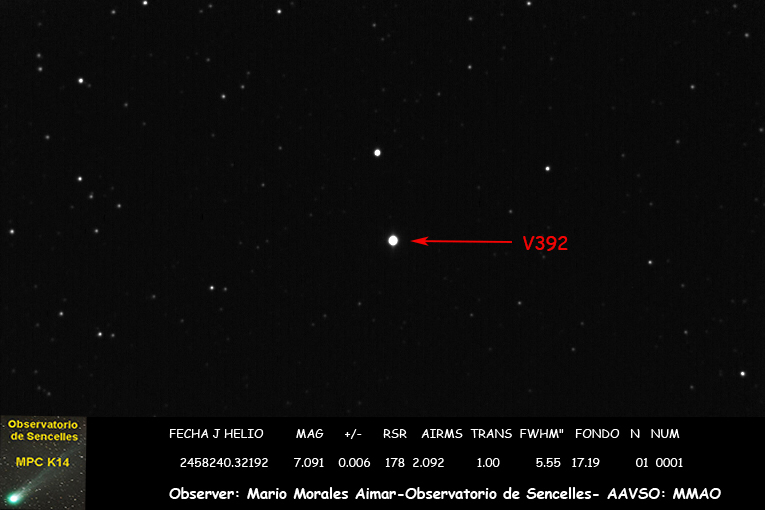 Final AAVSO observation before solar conjunction: 2016 Apr. 19.86573 UT, V= 14.341 mag (Steve Johnston). Pavol A. Dubovsky (Slovakia) writes in vsnet-outburst 22120: "I can confirm the presence of the bright object at the position of V392 Per. I started multicolor photometry." Indeed this star is a nice and brillant surprise! My visual estimation was just between two stars 5.65 and 6.78 of the Tycho-2 catalog so just 6.2. Thank you Patrick for this rapid info. I estimated V392 Per as mag 6.3 in binoculars at 00.59 UT (29-30 April 2018). The sky had just cleared. Just got a visual estimate of the object at m=6.6 with 10x50 binoculars and a chart for V392 PER at 02:25 UT. It seems odd that the VSX has the visual range for V392 PER as 14.1 - 16.9. Re: "It seems odd that the VSX has the visual range for V392 PER as 14.1 - 16.9." That was the magnitude range before the current major brightening. The VSX page for V392 Persei will be updated very soon. 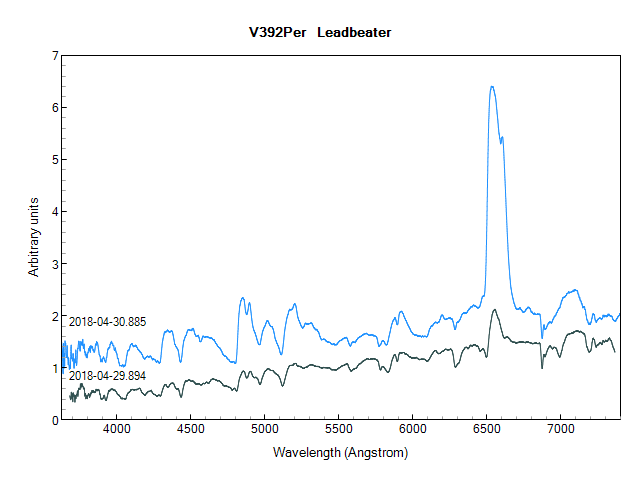 Nova eruption of V392 Persei spectroscopically confirmed! Absolutely amazing that we have the chance to witness a CV, previously classed as a DN undergo a classical nova outburst. Unless I'm mistaken, this situation has never been observed to occur before, ever. WOW ! 20:52 UT, 6,44, 6.68, 6.52m, visual Binocular 10x50, limit=+7.0m, cirrus, semitransparent cloud cover. I'm working on an AAVSO Alert Notice for this nova eruption. If you have not already submitted your observations to the AAVSO International Database, please do so as soon as possible. I will be issuing the Alert Notice later today and would like to include your observations in it. I concur with Steve in his post above. In my long observing career I can not recall, nor even ever having read about, any known dwarf nova system under observation entering a truly nova state, although several old novae have subsequently become dwarf nova long after their iitial nova outburst. If these stars can move back and forth between the two states (N-DN), I should imagine this would alter our concepts governing these stars considerably. Prior to the nova eruption of V1017 Sagittarii in 1919 (6.2 mag) a dwarf nova outburst was recorded in 1901 (10.8 mag) – however, that dwarf nova outburst was noticed only 45 years later (McLaughlin 1946). The nova is extremely dim (~24 vis) at quiescence and DN outbursts reached ~19. Thoughts? 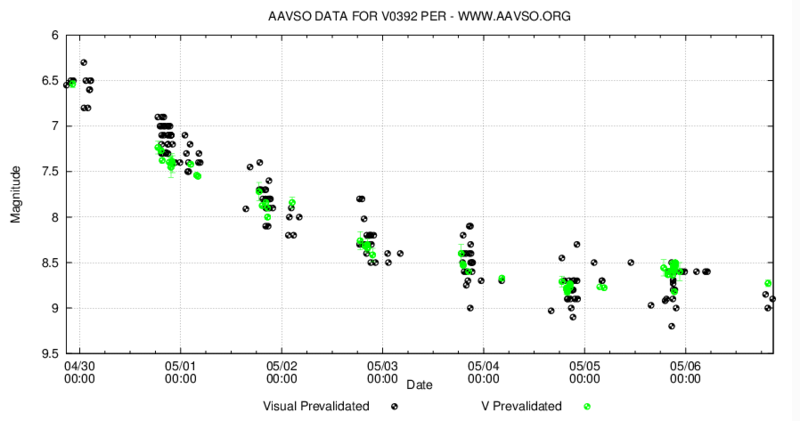 AAVSO Alert Notice 633 announces and reports on the nova outburst of the formerly UG-type dwarf nova V392 Per. Please see the notice for details and observing instructions, especially regarding a close-by companion. I observed visually last night, estimated mag 7.3 so yes, appears to be fading. Plan to look again tonight. Elizabeth, will you be adding more observations to the alert notice? Thank you very much for observing V392 Per - it's exciting to be able to participate in such a rare event! No, I will not be adding more observations to Alert Notice 633. Once an Alert Notice is published, we don't add more content. If circumstances warrant, we may issue another Alert Notice on this object, and that would include the most recent observations as of that date, but right now we don't have plans so to do. Your observation - which I hope you have submitted or will submit to the AAVSO International Database - is very valuable and will be used by the many researchers studying V392 Per right now and by those who will be in the future. Again, thank you! We intend to see the star again, tonight. I found this article in Sky&Telescope that explains links between classical novae and gamma ray emissions : http://www.skyandtelescope.com/astronomy-news/gamma-ray-nova-explained-1... , it also has a link to the scientific paper in Nature at the end. I used the 8" Dob this time, estimated mag 8.0. There is a 9.3 mag star about 4' to the east, seems they will soon be a matching pair. Last night I could observe it, and gave me magn. 7.091 with CCD and no filter. Attach picture of it. Hi, so I took a look today (2nd of March) at 20:01 UTC with a 10'' Dob, seems barely brighter than the comparison 9.3 mag star. It could be in the 9 - 9.2 mag range by the looks of it. Let's see tomorrow! I have terrible clouds here this night, and barely got a glimpse of the field thru semi-transparent clouds, but to me it seemed definitely more like 8.2, not 9.2, consistent with other reported observations. It might be two more days before it gets to something around 9.2, where it might get challenging for some DSLR observers to follow it. 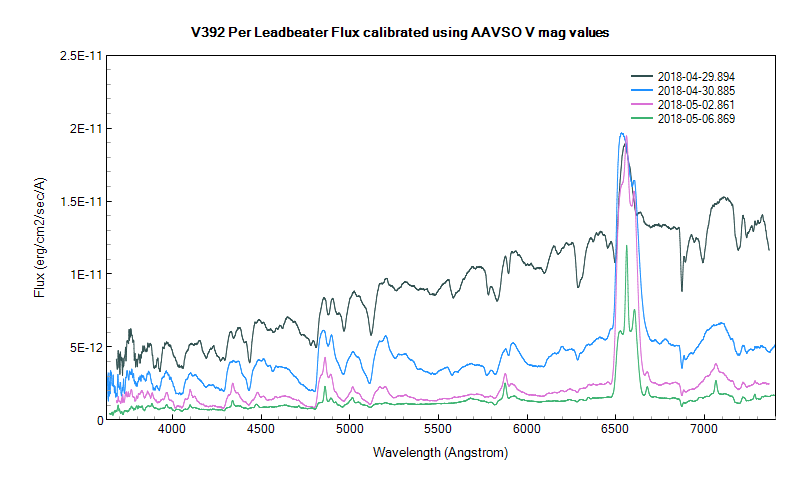 My spectra for 20180429, 0430, 0502 calibrated in absolute flux using AAVSO database Vmag values. Note as the star fades how the peak flux at H alpha remains approximately constant as the continuum falls away. The flux in the Halpha line is currently ~1/3 of the total flux in the visible range. can I use your spectrum in an artciule I am preparing on V392 Per for the Flemish amateur astronomy journal Heelal? Hi Elizabeth - long time no talk! As this star fades more, there seems to be a large sequence gap between 9.3 and something like 13 or 14. Is someone working on a fill-in sequence from APASS? 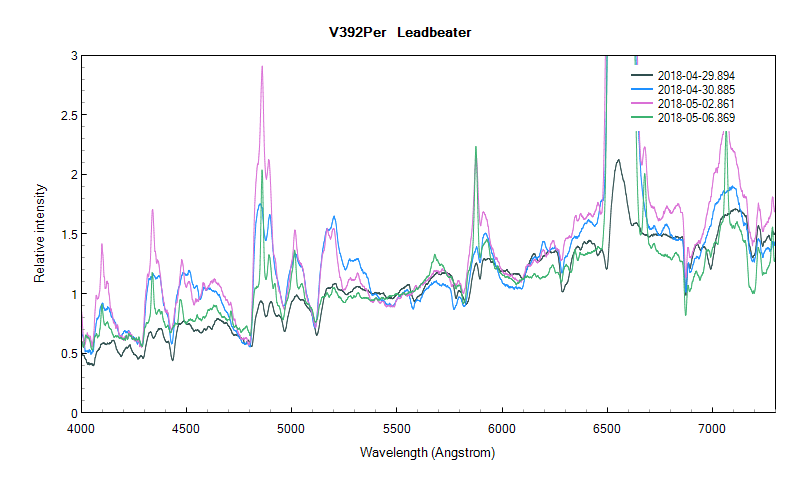 Yes, V392 Per is fading quite fast - faster than I, for one, expected. The Sequence Team will fill out the mid-range of the sequence. We'll post here when it's available. Tim Crawford of the Sequence Team filled the mid-sequence gap. Also, from 104 fainter, he replaced the photometry data for some of the stars for better color continuity. Please be sure to use the latest sequence as the nova fades. Thanks! Thanks Elizabeth, looks like a nice sequence range now. New expanded sequence - thanks! Thanks so much, Elizabeth. Good to see Tim still on the sequence team - thanks Tim, too! (Miss him from our two runs on the Plaskett Telescope at the DAO about a decade ago now!) I've pointed all of our Canadian observers to the new charts, but it has to clear up across the country! Luckily, I just cleared, so I am headed outside for the next estimate! Good point Rick, in a few days we'll be needing them. I estimated R392 Per at 8.4 mag tonight. With the light curve starting at the peak, I have to wonder if discovery time was the actual peak. Maybe two days earlier it reached mag 5, and nobody noticed? Are there all-sky surveys that AAVSO can check for such? You (and others) might also be interested in Prof Steve Shore's commentry on this event on the ARAS spectroscopy forum. I will give you a copy of the final text as soon as it is ready. It will be in Flemish language, Also thanks for the other links. 04.05.2018, 16.02UT, 8,8, 9,05, 9,25m, Tatiana Donchenko, Uzbekistan, ZT-10x30, limit=+9.0m. z=~80o, star sky 5.0+ !! Brief and weak rebrightening during May 5? 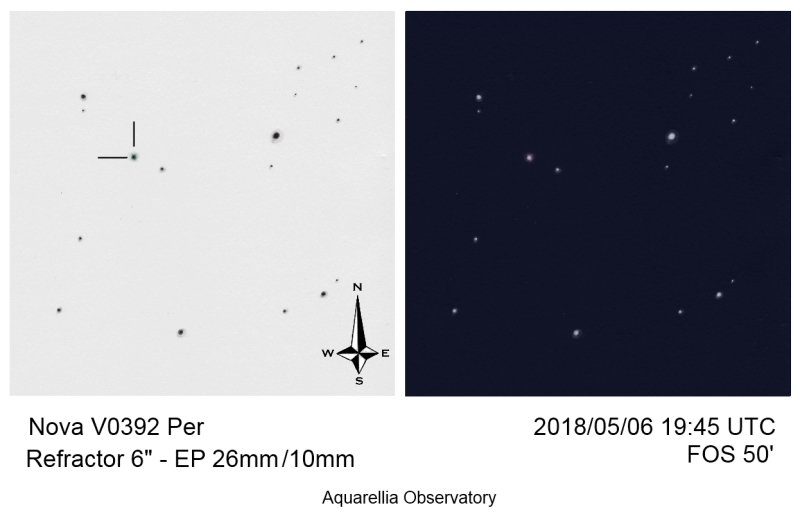 Observations reported during the last two days suggest that the nova may have experienced a brief and weak rebrightening of about half a magnitude during 5 May. There is a relatively large scattering in the observations but the brightening seems indeed to have been real. I agree, my last visual observation May 6th 19:45 UTC was +8.8, with minimum 120x the light reddish color is visible. My DSLR measurements tonite (quick look evaluation) suggest ca V~8.7 mag , so it doesn't seem to rebrighten in V anymore, but definitely the rate of decline has slowed. At this pace it will be accessible to DSLR observers with telephoto lenses much longer. I have a question. 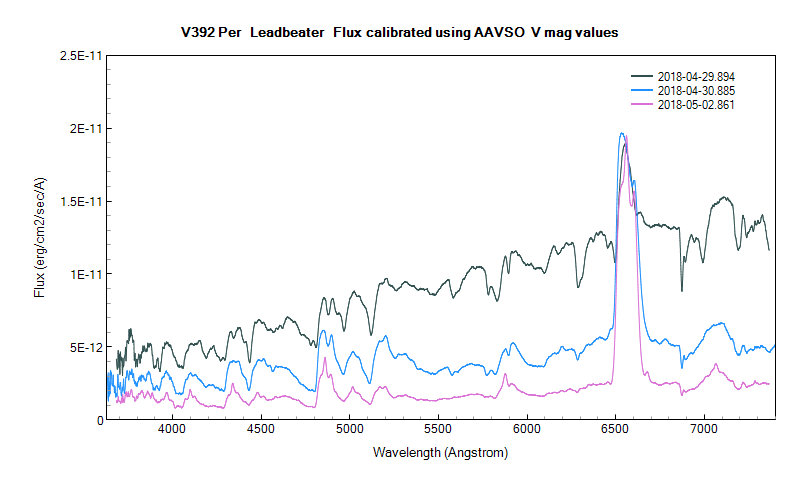 If these spectra are calibrated to abs flux, doesn't this mean the Nova's continuum color is shifting towards the blue end with time, instead of getting redder ?? Is that to be expected? EDIT: would that mean that the material that was previously reddening the continuum wasn't actually interstellar but instead circumstellar, and the ejected mass is now breaking thru it (just guessing, I'm not an expert on this). I dont know if this is typical behaviour but it is probably significant that this system is not in thermal equilibrium and as time passes and the temperature drops, the material also thins out so we see deeper into regions where the temperature may not be the same. Thanks for the explanation, indeed the "big picture" looks more like a constant color. Just estimated V392 Per from an image I took with the Slooh C3 Astrograph. Using comp stars 87 and 93 I estimated this nova at mag 8.8. Tonights observations suggest that V392 is slowly fading again. My own observation made this evening (05/08/20/58/00 U.T.) show V392 at mag 9.1.